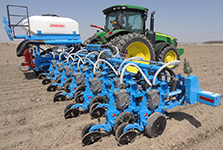 The latest planter and drill attachment offerings from some of the industry's leading suppliers. The new Truax “On The Go” series grain and grass drill saves you time in the field and keeps you out of the maintenance shop. You can go from tilled conditions to no-till with the flick of a hydraulic lever. Wrenches are no longer needed to change from one mode to the other. 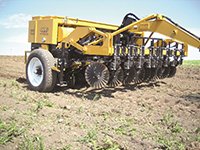 Double-row bearings on planter discs provide longer bearing life and reduced maintenance. An easy-access calibration nut lets you quickly determine your seeding rate, saving calibration time and reducing seed costs. Check out additional advantages of the “On The Go” drills and review our full lineup of seeding equipment. The Monoshox® Air is the latest version of Monosem’s field-proven Monoshox® down-force system for smoother planting in all conditions. It’s available on Monosem NG+4 row crop planters. In this new version, down-force adjustments on the Monoshox® Air are set from the cab in 1 psi increments from 10-100, equal to 84-400 pounds of down pressure. The Monoshox® system uses a high-quality, valved shock absorber that resists upswing and rebounds quickly. This allows the row unit to cut through trash and tough spots in the field instead of bouncing. Even travel helps maintain consistent depth control for better seed spacing and plant emergence. From food production to cover crops, the Great Plains 10-foot End-Wheel No-Till Drill (1006NT) combines the productivity of a large drill with the versatility of a compact unit. Its large end-wheels provide unmatched ground gauging in rugged terrain and reduced side-loading on contours and sidehills, extending the life of the drill’s no-till openers. 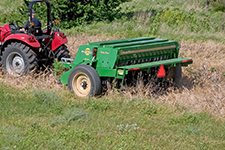 Features include a rugged frame, four-speed gearboxes, an automatic clutch that disengages when the drill is lifted and rain-tight lids for maximum seed/fertilizer protection. Seed-box options include 25-bushel main seed box, 10-bushel native grass box, 2.4-bushel small seeds box, 10-bushel second seed box and 9.2 cubic feet of fertilizer.